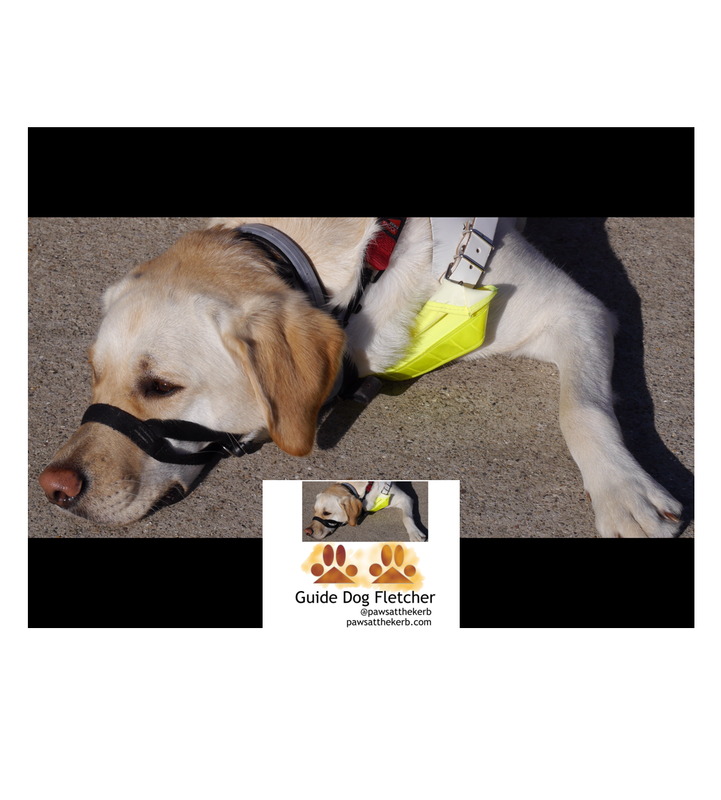 Guide dog Fletcher here sniffing out the best news from the streets and grass to post in this blog. Keeping my human safe with paws at the kerb™. Qualified August 2015. Can often be found at the kerb, snoozing or on Twitter @pawsatthekerb. WordPress has helped me place digital cookies on your device to collect info so that your website experience is barking. By staying on my website without changing your device's settings, we'll assume that you're ok with having digital cookies from WordPress and third parties. Find out more about digital cookies, as well as removing and blocking them, via WordPress' support page on cookies. Enter your email address and hit the "Follow" button to receive virtual woofs from me about new posts (humans call it email notifications) and follow my blog. Woof, it’s me guide dog Fletcher! I’m back. It’s been a tough few months. So I wanted to share with you yesterday’s mega day out. We went to see ‘Hamilton The Musical’ in London. It was pawsome. As part of making theatre accessible to those who are blind or partially sighted, we went to an audio described performance of Hamilton. The firm Vocal Eyes had been commissioned to sort this. They had also arranged a touch tour to bring their audio descriptions to life – I got to go on the touch tour. I was “In the room where it happened“. Here I am on the Victoria Palace Theatre stage where Hamilton was showing. I met some of the show’s cast and crew. They started off by lining up in a row (shown by photo) and introducing themselves to everyone. And extra information was provided by the Vocal Eyes team. I’ll tell you more about three of the cast in a moment. After the intro, actress Ellena Vincent stepped out of the line up to greet us. She’s in the ensemble and was in a fine gold coat over a corset and leggings. She brilliantly described her costume and let Fiona, my pawtastic human, feel all the detailing on her clothes. Of course, I had to have a photo with her. “You simply must meet Thomas. Thomas!“. Well, it would be rude not to. Here I am with President Thomas Jefferson who was decked out in rich expensive purple cloth. Jason Pennycooke, who plays the characters Jefferson and Lafayette, had a woofderful laugh and wicked humour. Afterwards, I got to meet the main man. I barked: “What’s your name man?” “Alexander Hamilton!“. Jamael Westman who plays Hamilton gave me pawtastic fusses. He was very tall and down to earth. He was gentle with me and took the time to make me feel special. I even got a little scratch from Jamael. It was all very exciting. Did you say guide dog stage left? Must dash Jamael. Oops, sorry about the photo. There were eight of us guide dogs present. Of course, I had to sniff the others out and give a waggy tail. We kept our humans on their toes to stop our leads getting tangled in all the excitement. Then Andy (my human no.2) and I discovered some goblets and muskets for Fiona to touch. This meant that she could get even more out of her theatre experience. After all, she can’t see much of what’s happening on stage during the performance. (In case you’re wondering, she sees some colours but hasn’t a clue what the colours are as everything is distorted and blurry. As to being able to see goblets and muskets on stage, impossible). I got a bit worried when I found the corset. Didn’t want anyone putting that on me. I’d be happy to try on this gorgeous robe belonging to King George. And the wooden stage set was pretty woofderful too. High paw and thanks to the Hamilton cast and crew plus Vocal Eyes team for a pawsome touch tour and introduction to Hamilton. It was then off to be looked after by the theatre staff during the performance. Whilst I was offered the opportunity to see ‘Hamilton The Musical’, Fiona thought it might be too loud for me. Besides there was no space for me to sit – let alone lie down – by her seat. My humans, Fiona and Andy, said ‘Hamilton The Musical’ was wooftastic. Definitely five stars. Woof and paw. Guide dog Fletcher. Woofy thank you for all your kind messages! This blog post follows on the back of yesterday’s post. These double blog posts are in remembrance of two people close to us who died within twenty-four hours of each other. And to mark my guiding during sad times, tough times. The stuff that doesn’t often get covered. Don’t worry; my next adventures will make you smile. As I was woofing, it’s been a tough few months for all of us. Us being me, guide dog Fletcher, and my pawtastic humans, Fiona and Andy. Fiona’s had two operations. The last one was not that long ago. She’s got another month or so of recovery. Yes. I’ve done a lot of guiding in hospitals this year. And of course I’ve been good and settled quickly. Now as if having two people close to us dying wasn’t enough, when I was out guiding Fiona, I saw another dog get badly hit by a car. I was very shaken up by what I saw. I couldn’t really process it. I just wanted to be with my humans. I got upset when I saw people I didn’t know and I had to stop working for a while. Fiona and Andy thought it best to cancel our holiday. With support, I’m a lot better now and back in harness. Yes, my paws are back at the kerb. And riding a golf buggy-type vehicle this week. Yes, this was a first for me. And it was a tight fit. And a bit snug getting off. We were going to an undisclosed location for the scattering of ashes of the two people close to us who died earlier. I did some all-terrain guiding and still managed to find the seat. We were amongst some wooftastic trees (and stop right there, I can guess what you might be thinking. I did not leave a souvenir. Tempted. But no). Permission had been granted for the scattering of the ashes. The place felt just right. Once again, I was on paw to comfort Fiona. You see there’s more to being a guide dog than guiding. It was a physically and emotionally tiring day. At the end of it all, there was only one thing for it. I just had to snooze with my favourite cuddly toy, Barney the bear. Paws in sadness, Guide dog Fletcher. Woof, I’m back! Yes, it’s me guide dog Fletcher. First a big woofy apology for the pause in my blog posts. When you read this blog post, I hope you’ll understand why. It’s been a tough few months this end. Definitely sad times. My human, the pawtastic Fiona, says “we’re juggling a lot of curve balls still”. I’m not sure what she means because they sound fun and it hasn’t been. Two people very close to us got ill earlier this year and then died within twenty-four hours of each other. I saw each of them just hours before they died. I’m in mourning. I got to guide Fiona around a lot of new places and had to concentrate hard. Some of this was during the “Beast from the East” and “Mini Beast from the East” snow storms. Remember them?! Lots of paws in the snow. And when we got to our destination, sometimes I didn’t get a chance to get in my usual snoozing. For often we were visiting hospital wards which were quite noisy with people coming and going. There were also people ill in beds shouting out unexpectedly. I had to keep one eye open just in case Fiona needed me. Fast-forward in time and I guided Fiona to the double funeral. Now they certainly didn’t cover this in the Guide Dogs for the Blind training manual. Human no. 2, Andy, was also on paw to lend support. Thankfully no snow this time. Just the start of soaring temperatures. The closed funeral took place at Golders Green Crematorium, London. I was very good during the service even though Fiona was upset. I liked the way the sunshine rays touched the coffins. And in case you’re wondering about the photos. The funeral was very private and the photos were taken to help Fiona later figure out what was going on; her eyesight is very bad and she barely gets an impression of her surroundings. That’s why she needs me. I also provide impawtant emotional support. Now the two people who died were great travellers and loved visiting places. And Golders Green Crematorium is steeped in history. I don’t know how it came about but we ended-up getting an informal private tour with Eric Willis, Head of Maintenance, who also shared some of his pawsome poetry with us. It makes me feel a little less sad that the two people close to us had their funeral at the same place as the psychoanalyst Sigmund Freud, the ballerina Anna Pavlova, the musician Marc Bolan and the writer Bram Stoker amongst others. P.S. Given that the two people close to us died within a day of each other, I’ll also blog tomorrow in remembrance of them. P.P.S. Our sympathies also go out to our four-pawed friends at the Bunnington Post on the loss of dear Haas. (c) pawsatthekerb, August 2018; updated September 2018.